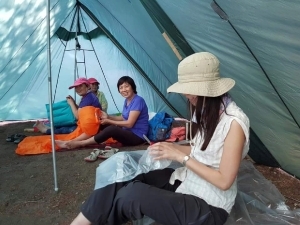 This was an overnight excursion which involved camping (no hut, but cooking shelter and toilets). Participants slept on the ground in tents. Water was from the lake and had to be boiled. We booked four prime sites (Sites 26-29) at the DoC camping area. These sites suited us well. Everyone travelled to Rotorua in the afternoon/evening. Twelve stayed at the Rotorua Thermal Holiday Park and another 12 (the married couples) stayed overnight at Holdens Bay Holiday Park. Those at the former were able to enjoy a swim in the hot pools. Gear and food for each person to put in his/her pack was distributed to everyone on Friday evening. Supper and breakfast were supplied. 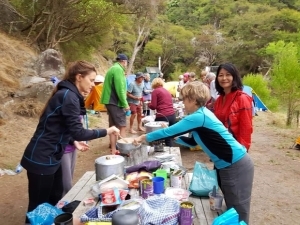 We all met at the Te Wairoa carpark, Tarawera Road, at 8:30am where the trail began. Stephen and Charmien joined us from Tauranga, making a total of 26 participants. In addition Katrina and Ruth joined us for a walk in and water taxi out the same day. Some 21 packs were taken down to Tarawera Landing, where they were loaded onto the launch "Sophia". Phillip accompanied the packs on the boat to Hot Water Beach. Twenty-seven walkers set out by 9am. 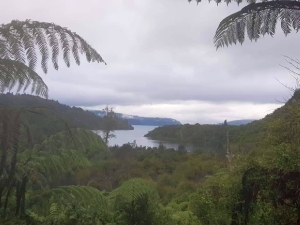 The 15km track began at Te Wairoa car park, off Tarawera Road, with opening views of beautiful Lake Tarawera. 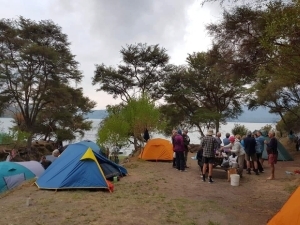 The group followed the lake side trail through Katukutuku Bay and, 5 km in to the trail, stopped at Hawaiki Bay to enjoy lake access and a picnic area with toilet facilities. The track continued with intermittent climbs, through lakeside bushland into Te Hinau Bay, passing over Twin Streams cold springs. The bridge over Wairua Stream was closed, so we had to ford the stream. 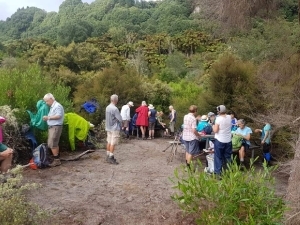 After an uphill climb to reach the Rotomahana lookout point, the group descended into Te Rata Bay to set up camp. Walking times varied from 4.5 to 7 hours, but most had arrived by mid-afternoon. Phillip had unloaded the packs into a shelter, and had managed to put up some of the tents. We erected six 2-person tents and 2 double flys, and one half-fly with a bell end. 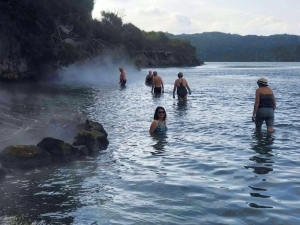 Everyone enjoyed a soak at Hot Water Beach, where hot water bubbles up from the lake bottom to mix with cold. 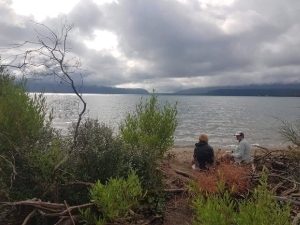 Phillip went on a late-afternoon reconnoitre of the trail along the lake edge and over to Lake Rototmahana, which took him 1.75 hours return. Three catering groups successfully prepared the evening meal. On dusk we met to share humorous anecdotes and tramping memories. Phillip led a reflection on the theme of "Choices". There were two ways of getting to Hot Water Beach: Walk or water taxi. Likewise two categories of people in the world: those who follow Christ and those who don't. There are two categories of Christian: Those who are half-hearted and those who are wholehearted...I know all the things you do, that you are neither hot nor cold. I wish that you were one or the other!�But since you are like lukewarm water, neither hot nor cold, I will spit you out of my mouth! (Revelation 3:15-16) A very appropriate analogy for a location with hot, cold and lukewarm water! Which categories are you in at the moment? Phillip read three original poems: Alternatives, Choices and Crossroads. After we had turned in, it began to drizzle, which lasted most of the night. We woke to an overcast sky and light drizzle. After breakfast, 21 packs were taken down to the shelter for the water taxi. Five took the 9:30am water taxi out, filling in time at the Landing cafe! Several wandered over the isthmus to Lake Rotomahana during the morning. Another five (with the remaining packs) came out on the 12:30pm water taxi. 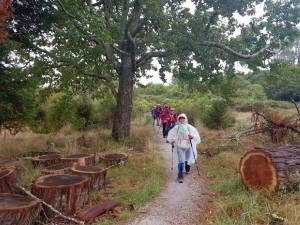 Sixteen walked out along the trail, with two hitching a boat from Hawaiki Bay! The water taxi shuttle helped to transport water taxi riders from the Landing back up to Te Wairoa. By 1:30pm we were all back at Te Wairoa carpark for a late lunch, a final few words and farewells, before hitting the road for home. At 28 persons, this was the largest weekend tramp group for a considerable time. It was probably also the biggest agglomeration of tents we had used for some time. COST: $50 to $98 depending on preferences, plus $44 transport to and from Auckland.